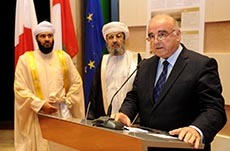 The exhibition "Oman's Message of Islam" was inaugurated at the St. James Centre for Creativity in Valletta, the Maltese capital, by His Excellency Dr. George Vella, Foreign Minister of Malta; and HE Sheikh Ahmed bin Saud Al Siyabi, Secretary-General of the Office of the Grand Mufti of the Sultanate. Among the guests were HE Joseph Mangion, Ambassador of Malta to the Sultanate, a number of ambassadors accredited to the Republic of Malta and other government officials from both Oman and Malta. HE Sheikh Ahmad Al-Siyabi thanked the Maltese Foreign Ministry and St. James Cavalier Centre for the fruitful cooperation and organization of the exhibition. He pointed out that the Omani civilisation is based on the good qualities in dealing with others and the respect for other people and religions. He said: "Omanis are known through their history, that they are tolerant in religion and tradition and they are living in peace without any kind of violence or disrespect against other groups or factions." 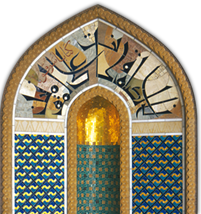 This exhibition conveys Oman's Message of Islam, which will be shown around the world. HE Dr. George Vella, the Foreign Minister of Malta, mentioned that this exhibition occurs in conjunction with the celebration of forty years' relations between Malta and Oman, which began on the fourth of November 1974. He emphasized the importance of strong common relations between the two sides, not only at the official level, but also between the peoples of Malta and Oman. "The exhibition comes at a very important time, as violence and extremism prevail throughout the world, confirming the need for tolerance, understanding and coexistence. Malta is proud to host this exhibition, which is ground for further bilateral cooperation between Malta and the Sultanate of Oman and which will lead to further activites being undertaken between both sides in the future." At the conclusion of his speech, the Maltese Foreign Minister thanked the Ministry of Awqaf and Religious Affairs for its cooperation which resulted in the placement of this exhibition in Malta, and encouraging all to take advantage of this opportunity and review its contents.